Finding balance in the whirlwind that is life. Long time no post my friends! I think you all know why though: I got married!! WOOHOO! The past month has been a whirlwind but I would not have it any other way. With all the craziness that was taking place in January, my skin needed some extra TLC and I'm so glad that The Detox Market allowed me to try their January Detox Box. I had no idea what the products would be, but I'm so excited that they actually came in clutch during this crucial time of tests, traveling, and stress before the wedding day! If you haven't heard of The Detox Market before, they're a retailer of all natural, organic skin care, make up, health items, and more. They are one of my go-to place for any of my skincare or make-up needs! Something they came out with recently was The Detox Box, and it's a monthly subscription box that has products valued at least $90 or more. The January box was filled with two products from Tammy Fender: The Epi-Peel ($80 value for 1.7oz) and the Bulgarian Rose Water ($15 value for 1oz). My first impression on seeing the products was that they were small, especially the Epi-Peel, but honestly after using them, those two products pack a punch! Kaolin Clay softens skin and refines pores while Watercress repairs damaged tissue and slows aging with Vitamins C and A, plus beta carotene. Pure Moroccan Rosemary, Far West Native Spearmint, and Panax Ginseng energize, decongest, clear, and oxygenate the skin. Grapeseed Oil and Shea Butter soften and soothe. After trying it out, my skin legit felt so smooth. The feel of the exfoliating grains were very very fine - one of the finest I've ever tried, and I truly think that's why my skin felt as smooth as it did after use. In terms of the amount of product used, you really only need a little bit. I would say a dime size or maybe less. Also, you only use it 2-3 times/week, so now I see why it's a smaller size. Next up: the Bulgarian Rose Water Facial Toner. Now, rose water toners are not new to me - I've used the Heritage Brand one from Whole Foods. So I'm always down to try different brands and see how they compare. The January Detox Box has a sample size of the Tammy Fender toner ($15 value), and although I love it so much and think the formulation is wonderful, I wouldn't spend $65 for the full size. This little one though, has been the perfect size for travel for me this past month so I will give it that ;) I might even reuse the glass bottle for travel purposes. Bulgarian Rose Oil and Water tone, hydrate, strengthen weakened skin, and repair tissue damage. Spiritually, the power of rose strengthens your emotional center and reveals love and beauty. Overall, I love that I got in the January box and I'm glad I got to try out some products from the Tammy Fender line. It's a brand I've seen before but just never got around to purchasing anything from it. The Detox Box is a great way to familiarize yourself to green beauty brands, or if you just like to try new brands! In terms of the price-point, it's $49.95/month if you just get one time. It goes down to $44.95/month for 3 months, and then $39.95/month for 6 months. I would say the price is a little steep for the almost $50 price tag for just one box at a time. You would definitely get more out of it if you commit to the 6 month run of detox boxes. So, it just truly depends on how much you're willing to invest in the products. Keep in mind, you won't know the products/brand until after the start of the month, and that sometimes they can possibly sell out. Also, the brands will be green beauty specific so that's another thing to keep in mind when looking into purchasing this box. I will say though, that green beauty products are on the more pricier side so this box may be a good way to try some products out so you're not paying full price. I hope that little run-down on the January Detox Box was helpful! Let me know if you guys have any other questions. How is it almost 2017?! Although I’m EXTREMELY excited for it to be 2018(because one more year closer to graduation AND I’ll get married soon) I can’t believe how time literally goes by SO FAST. Also, I just want to thank you all for continuing to follow along on my blog as well as on my Instagram and it’s because of YOU that we can make this happen! With that said, here’s a review of Medelita Element Scrub. Just kidding y'all. But seriously, next thing you know those phrases will be coming right out of our mouths because it's going to come by so fast! With that said, I'm super excited to bring to you all my first EVER Holiday Gift Guide. Now that I’m out of my surgery rotation and in pediatrics, it’s back to wearing professional attire. Since in peds, there are lots of moving around with the kiddos, mixing the physical exam with some playtime I’m lately opting for some leggings! I’m wearing one of my favorite ones here and they are from Zara. It’s navy blue with black paneling on the sides! I love pairing it with a longer top, also blue but in a different shade. I feel like doing this is one way to pull an outfit together. Another way to accessorize a professional outfit in medical school is through your stethoscope! Can y'all believe it's already almost OCTOBER?! This year is just flying by so fast, and um side note, there's only 119 days left until J + I get married. SAY WHAT?! Yes. So time is definitely flying. Today, I want to share with you all how I was able to whiten my teeth at home, safely and effectively! When I was younger I tried crest strips and all that but never really was consistent with it and felt like it didn't make a difference for me. So, I was very excited when Smile Brilliant contacted me and allowed me to try out their teeth-whitening system! I'm a little bit over a week into my surgery rotation and it's been such a different experience! I was in family medicine for 8 weeks, and so being in the OR and in the surgery clinic has been such a different environment. One of my most favorite thing about it is the team work - each and every individual plays a vital role in the outcome of the patient. Anyway, I digress - today what I really wanted to share with you all is the Medelita Ionic Jacket! Which by the way, I wish I can wear into the OR. This will be a "first impression" review since I haven't gotten a chance to actually wear this out to the hospital. I did wear it around the house with my workout clothes to lounge in. Hope you all enjoy this review! Color choices: there are only two options available, navy blue or black. While the choices seem underwhelming, it's the two colors that are very versatile to wear within different hospitals. After all, this is meant to be a scrub jacket. Style: I love the athletic style of this jacket, hence why I was wearing it with my workout clothes! It's got a sleek look to it, all the pockets you can ever ask for, and also a vent in the back to keep you cool. Also, the back is slightly longer to cover the tush if that's something that you like! As I mentioned, it's got A LOT of pockets so you're sure to have a place for your snacks, phone, pens, and whatever else you keep on hand. Fit: Now, while the shoulder area fit me just fine, i found the length to be a little long. I know that this specific jacket was made to be long, but I'm only 5'2" so I think it's a little longer on me. This was not a big problem for me though! It's not body-hugging either, meaning the fit is looser on me. I guess different overall fit for different body types, but you'll see down below how it lays on my frame. (I got the XS for reference). 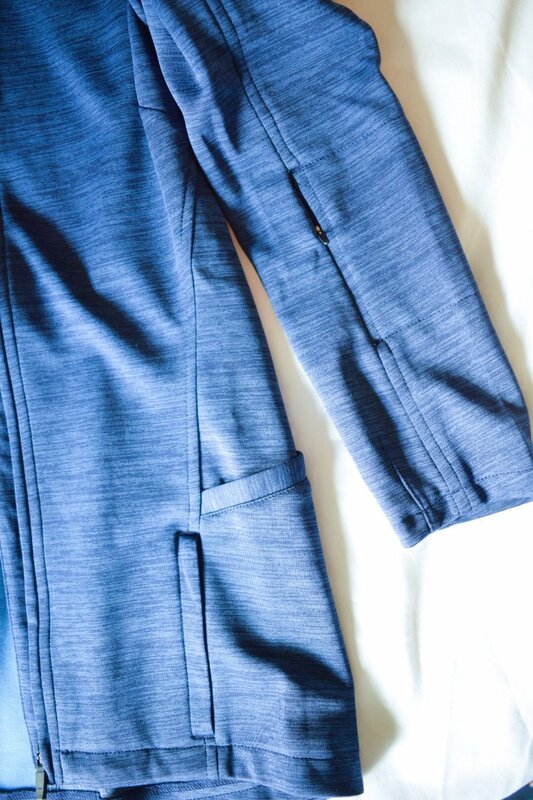 For more information about the Medelita Ionic Scrub Jacket, click HERE. To get 15% off your purchase, you can use the code "LIFEINTHEMEDLANE1" on check out! (And we can twin ;D).